Investors will continue to lock their eyes on the state of the U.S. economy, which has taken on a new sense of urgency after the forced federal spending cuts were triggered on Friday. One of the most closely watched gauges of the U.S. economy -- the monthly jobs report -- is due out Friday morning. Hiring has barely kept pace with population growth in recent months, and the Labor Department noted last month that the unemployment rate has barely changed since September. That's not good news at a time when federal agencies are slated to cut $85 billion from their budgets in the next seven months. It will result in furloughs of hundreds of thousands of employees who work for the federal government and related job losses. If the cuts are in place all year, it will reduce economic growth for 2013 by 0.6 percentage points and reduce the number of full-time jobs created by 750,000, according to the Congressional Budget Office. Economists surveyed by Briefing.com are expecting the economy to have added 165,000 jobs in February, compared to the 157,000 in January, and are forecasting the unemployment rate to hold steady at 7.9%, barely changed from the 7.8% rate back in September. There are a number of other reports on the labor market due out throughout the week, including the payroll processor ADP's employment change data and initial and continuing claims. Economists surveyed by CNNMoney are anticipating that job growth will continue in 2013 at roughly the same pace as last year, when the economy added 2.2 million jobs. They predict the unemployment rate will end the year at 7.5%. Apart from the labor market, investors will also get a look at the Federal Reserve's Beige Book, a survey of regional economies, on Wednesday. The manufacturing sector will be in focus, as well. Several reports, including ISM services, factory orders, unit labor costs and wholesale inventories, are on tap. Investors ended last week on a high note last week, in part due to an Institute for Supply Management report that showed that activity in the sector picked up more than expected in February. But there is still concern about the strength of the global economy, since China's manufacturing sector fell unexpectedly in February. 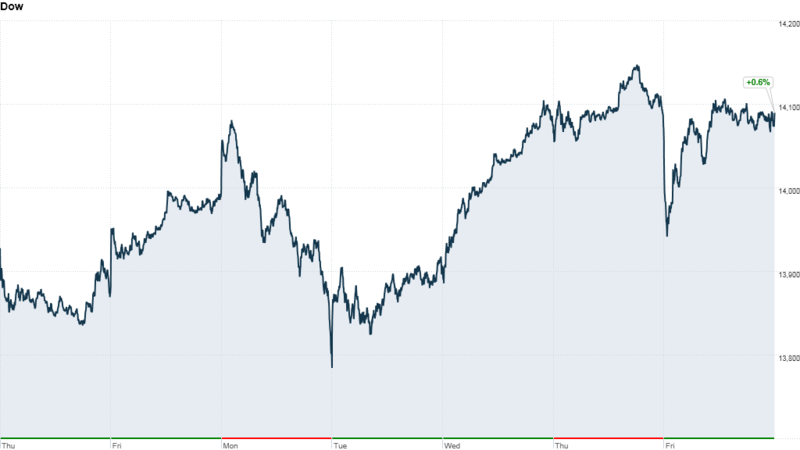 All three indexes finished higher last week, with the Dow Jones Industrial Average up 0.6%, the S&P 500 gaining 0.2% and the Nasdaq climbing 0.3%. The Dow is now less than 1% away from its all-time high reached in 2007, and the S&P is off less than 4%.